Constructed of ditches, earthen mounds, and immense blocks of stone, Stonehenge is now a protected archaeological site. Scientists have not unraveled the mysteries of its origins and purpose, but they do know that it was created in stages. Stonehenge probably began with a wooden structure sometime around 3000 B.C. 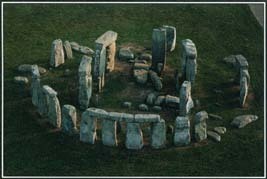 , and the standing stones were set in place between 2100 and 1500 B.C. Construction ended long before the time of the Celtic priests called Druids, but these religious leaders may have used Stonehenge and other ancient monuments in their rituals. Stonehenge, a prehistoric monument in southern England, was built in several stages over thousands of years. Its precisely arranged circular design suggests that the area may have been associated with religious rituals linked to the summer solstice. See also Celtic Mythology ; Druids ; Merlin .